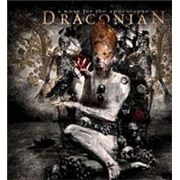 Swedish band DRACONIAN have released their fourth outing welcome release for the fans I believe. Their previous album, “Turning Season Within” arrived in 2008, so it has been a while. Jens Berggren at Fascination Street Studios has been turning the knobs, to guarantee an ultimate experience according to the info sheet, so what about it? Opener “The Drowning Age” is among the best I´ve heard from the band! They are a bit harder/rougher, which suits the vocals, and there is a force they don ´t always muster. The variety of the ensuing “The Last Hour Ancient Sunlight” is also well suited, and the riff is quite simple but effective. I quite like Lisa´s voice, as well as the keyboards. There is something cozy about the DRACONIAN doom. But they can also fall flat, as in the absolutely unremarkable “End of the Rope” and closer “Wall of Sighs”, which is also something of an archetype. But there are signs of a bright future here, as is the case of “A Phantom Dissonance”, suave, nice and clean arrangements, and Lisa´s voice. In between those songs they range from ok to better than average. There is so much to praise, but also the stale moments of simplicity or near monotony in the riffs. I´d say that they are getting there, but not quite this time around.